Times have change, and in the current world people love to experiment with their idea of decorating their home with the latest and trendiest home accessories. One such home accessory is a circle rug. Many call it as a round rug as well. A beautiful rug place right in the center of your living space becomes a dominant part of your interiors and helps in catapulting the entire home décor to a whole new level. We at The Rug Shop bring to you the finest collection of circle shaped rugs which you will not find anywhere. Not to mention the cheap and discounted prices which will not come in between you and the perfect round rug you desire. Choose from wide variety of patterns and designs which are carefully selected from across the world. These designs are perfect for circle shaped rug. We have round rugs made from various natural and synthetic fibers like wool, sisal, cotton, jute, polypropylene, polyester and sometimes even a combination of fibers produce a masterpiece. A shaggy round rug looks beautiful when placed in your room to compliment a larger rug covering the entire floor. In terms of color choice, you will not be disappointed. Choose from wide array of color combination or just go for the simple yet elegant solid plain round rug in the color of your choice. Get one today and add a different feel to your home décor. Due to the demand of geometric shapes in area rugs, circle rugs have become extremely popular among rug shoppers. 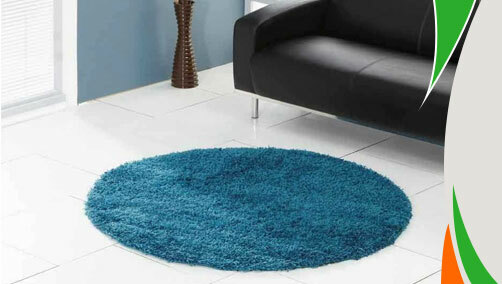 A circle rug is best suited for angular rooms or a room which is in square shape. It helps in maintaining the balance and symmetry. The entry to your home can become quite dramatic if a right circle shaped rug is place right in the center. A rug is the first thing which gets noticed when you or your guests enter your house. Placing a round rug shows that you have put a lot of thought in your rug selection and ensured that each element of your home decoration compliments the rug in its own unique way. The combined effect is just to feel proud off. To utilize the space properly a lot of people place a round dining table or a circle shaped coffee table in their house. If you have one, then a circle rug would be the right match for such furniture and the entire ambience of the surrounding can be up lifted to a whole new level.